The first ever bill to allow limited use of cannabis for medical purposes was approved by the interim cabinet Tuesday. If passed by the interim assembly, the new law would authorize the Narcotics Control Board to set up plantations for growing and conducting experiments, Lt. Gen. Sansern added. The process of revising the law started late last year, prompting supporters to propose business initiatives in anticipation of cannabis decriminalization – with some falling short. In January, Prapat Panyachartraksa, farmer association chairman, announced a plan to build a 5,000 rai (800 hectare) marijuana plantation in Sakon Nakhon province, which failed to get permission from the health ministry. Hoping to fast forward the legalization process, a research team from Rangsit University unveiled a cannabis spray last month said to relieve pain in cancer and multiple sclerosis patients. 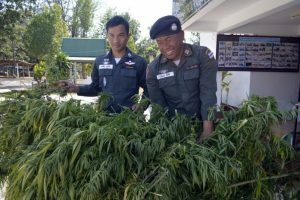 Under military rule, Thailand has made surprising strides toward drug decriminalization after a member of the ruling junta, acting as justice minister, declared the war on drugs a failure and embraced progressive attitudes toward implementing common-sense drug laws.